A quartet of home runs led the Sea Dogs to a 4-3 victory over the Reading Fightin' Phils (PHI). Mike Augliera pitched decently, allowing three runs on six hits across seven innings while striking out three. Aaron Kurcz picked up the win in relief, throwing two innings of one-hit baseball to close out the game. Of the Sea Dogs' six hits, five went for extra bases. Only five players collected hits, with Blake Swihart being the only member to not hit the ball out of the park. Long balls by Deven Marrero, Sean Coyle, David Chester, and Derrik Gibson were the only offense Portland would need. Salem broke out to an early lead to beat the Wilmington Blue Rocks (KC), 4-2. Justin Haley earned the win for a six inning-effort in which he allowed two runs on five hits while striking out five. Kyle Martin notched his fifth save of the year, throwing three innings of one-hit baseball to shut the door. Offensively, Jantzen Witte kicked things off with a bang, launching his first Carolina League home run, a two-run shot, in the first inning of the game. Reed Gragnani picked up two hits including a double. Greenville lost the lead in the late innings to fall to the Hickory Crawdads (TEX), 5-4. Daniel McGrath started decently, allowing three unearned runs across five innings on only four hits but the bullpen was unable to hold the lead. Jacob Dahlstrand took the loss after surrendering a run in both the eighth and ninth innings, though neither was earned and the walk-off run came on a passed ball by Jake Romanski. Carlos Asuaje powered the offense, goinging 3 for 5 with a double and two RBI. Kendrick Perkins, who hit his sixth home run of the year, was the only other Drive player to pick up more than one hit. Lowell won by a surprisingly low margin, beating the Vermont Lake Monsters (OAK), 4-1, despite out-hitting them 10-3. 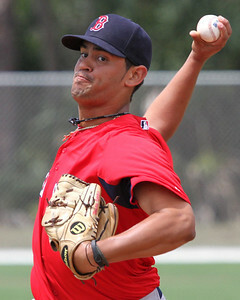 Jason Garcia (pictured) took home the win after firing six innings of two-hit, shutout baseball. German Taveras allowed Vermont's only run and Carlos Pinales notched his fifth save. Four Spinners had two-hit games: Bryan Hudson, Nick Longhi, Jordan Betts and Cole Sturgeon, though the only extra-base hit came off the bat of Raymel Flores, who had a double. The GCL Red Sox fell to the GCL Twins by a score of 4-3. Jose Almonte started the game, but took home the no-decision for his four-inning, six-hit and two-run effort. Sergio Gomez took the loss in relief, allowing another two runs in three innings of work. Williams Jerez closed the door with two innings of one-hit baseball. The Red Sox managed seven hits, though two came off of the bat off Darwin Pena. Jordon Austin and Derek Miller both added doubles and three other Red Sox had hits. The DSL Red Sox hung on to beat the DSL Orioles, 3-2. Daniel Gonzalez went five innings to improve his record to 5-0. He gave up two runs on four hits striking out four and walking two. Juan Barriento led the offense going 2 for 4 and with two singles and a run scored. Rafael Devers also chipped in with a single of his own. The Orioles loaded the bases in the ninth but Carlos Caceres closed the door earning his second save on the season. Player of the night: This night's honors go to Jason Garcia with the Spinners. Garcia is working his way back from Tommy John Surgery in early 2013. This start marks the third of four starts for Lowell in which Garcia has not allowed an earned run, lowering his ERA to an even 2.00.